As part of the next generation of cutting edge technology, the TAG Heuer Connected Modular 41 Smartwatch is a fusion of Swiss watchmaking and all of the functionality that advanced technology offers. The touch screen is covered with scratch-resistant sapphire crystal, and features a brightly coloured AMOLED screen for clear readability. A variety of apps can be access via the Play Store, including GPS maps for wayfinding and NFC technology for wireless payments. With a modular design, detatch and reattach the straps and watch heads of your choice to get the look that you want. 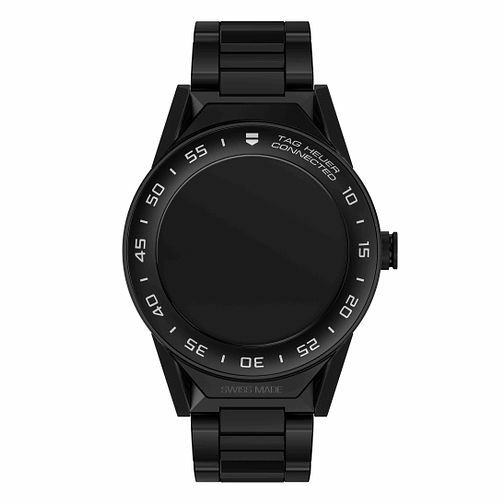 Features water resistance of up to 50m and the watch battery lasts up to 25 hours depending on usage. TAG Heuer Connected Modular watches are compatible with smartphones running iOS 9+ and Android 4.4+.